with antibacterial soap before reading this book. Run ... don't walk ... to wash your hands with antibacterial soap, because this is one picture book you would be crazy to miss! Scaredy Squirrel is simply incomparable. Think of the King of The Jungle. Scaredy is just the opposite. So don't lose time, get to know Scaredy, before he runs back to his tree. Scaredy pokes fun at everyone who gets so set in his/her routines that any deviation becomes heresy. This is a book that teaches you to recognize your fears, to embrace them and then laugh your head off with your kids! 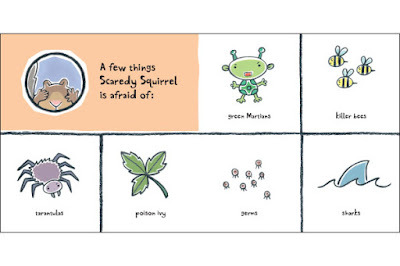 A small package that packs a big punch, Scaredy Squirrel is one of the most hysterical new picture books that we have enjoyed. "How good is it really? ", you ask. 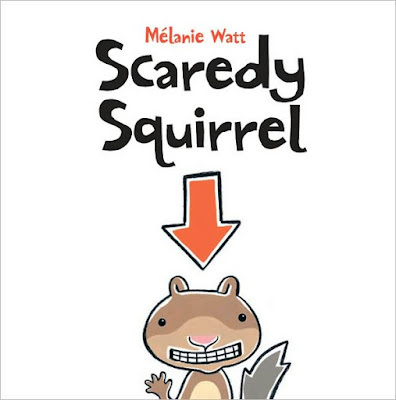 Well, it is so good that I recently ordered the remaining four books in the Scaredy Squirrel franchise. 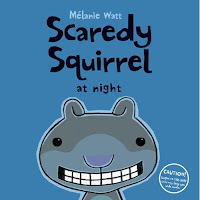 We just finished reading Scaredy Squirrel Makes a New Friend and we laughed our heads off. It is another hysterical addition to the series. "How good is it really? ", you ask again. Wait, you deserve another example. The books are so good that I am saving the remaining ones (Scaredy Squirrel Has a Birthday Party, Scaredy Squirrel at the Beach and Scaredy Squirrel at Night) as special treats for my two little pumpkins. And its not the kids who enjoying themselves only. 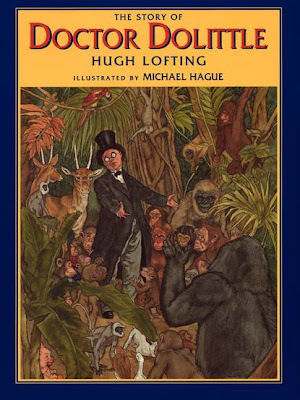 Parents must be ecstatic - reading aloud books like these! If you have kids, you know they have BIG fears. Spiders, dark, solitude, sharks, cars, flying, strangers, heights, ... you name it! Rational arguments don't help, you know that. They will outgrow their fears when they are ready. Yet, we can help. And there is no greater help than externalizing the problem. Scaredy is a squirrel that lives in a nut tree (convienient!) and he never ever left the tree, because of his phobias. His main sources of anxiety include tarantulas, green Martians, poison ivy, killer bees, germs and sharks. 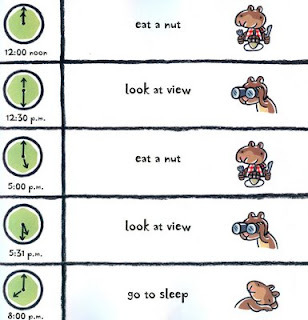 So, in order to keep his boring days manageable (note: Scaredy would never admit his days are boring), he develops a precise timetable for his activities. At well-defined intervals of the day, Scaredy eats nuts, takes naps, watches the environment from his tree. Everything is under control in the Scaredy Squirrel world. Yet, Scaredy is no empty-brained squirrel. No, he openly acknowledges that there are advantages and disadvantages involved with never leaving his nut tree. The positives of course include a fabulous view, nuts galore and unparralled safety. The downs include ... yes I know you heard them somewhere before ... the same old view, same old nuts, and same old place. Well aware that his decision to remain in the tree could be challenged one day by an unforeseen emergency, Scaredy started planning for the day that he may be forced down his nut tree. Like FEMA director Michael Brown - who is still remembered for his poor handling of the Hurricane Katrina crisis - Scaredy failed to forsee what would really unfold. Although Scaredy did prepare an emergency kit (containing treasures such as antibacterial soap, bug spray, a hard hat, calamine lotion, a parachute, a mask with rubber gloves, a net, Band-Aids and sardines), when the all important day came ... our little squirrel forgot to take his kit before jumping out of the tree. 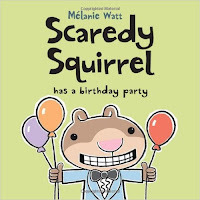 The appearance of a killer bee prompted Scaredy Squirrel's panic reaction and the squirrel goes through an unplanned life experience for the first time in his life. I must not reveal all, as it is time for you to check out what happens to the most lovable squirrel of the 21st century after he finds himself on the ground. This picture book will help your kids realize that fears are there to be dealt with, not ignored. Scaredy is a perfect vehicle to open a discussion about certain issues that your kids may not be too excited to talk about. Fear not, for Scaredy is here to help you deal with your own fears. So, it is time for you to find out what really happens when Scaredy gets down to the ground. Straight to bathroom to wash your hands with antibacterial soap first!